ESTERO, Fla. - The American Hockey League's Cleveland Monsters have assigned defenseman Justin Wade to the Florida Everblades. Wade, 24, has played in seven games for the Monsters this season, his first season of professional hockey after playing four seasons for the University of Notre Dame. A native of Aurora, Illinois, Wade saw ice time in 117 career games with the Fighting Irish and tabbed 17 career points on two goals and 15 assists. As a senior in 2017-18, Wade helped Notre Dame capture the Big Ten regular season and tournament titles in the program's first season in the conference. Prior to his college career, Wade played three seasons in the USHL, splitting time between the Fargo Force and Cedar Rapids RoughRiders. 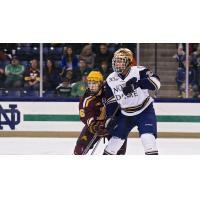 The 6-foot-1, 220-pound rear guard also appeared in two games for the U.S. National Team Development Program Under-18 team in the 2011-12 season. The Everblades host the Jacksonville Icemen on Wednesday night at 7:30 p.m. at Hertz Arena to continue a six-game homestand. Wednesday night is a $2 Wednesday, featuring $2 beer, wine and hot dogs.